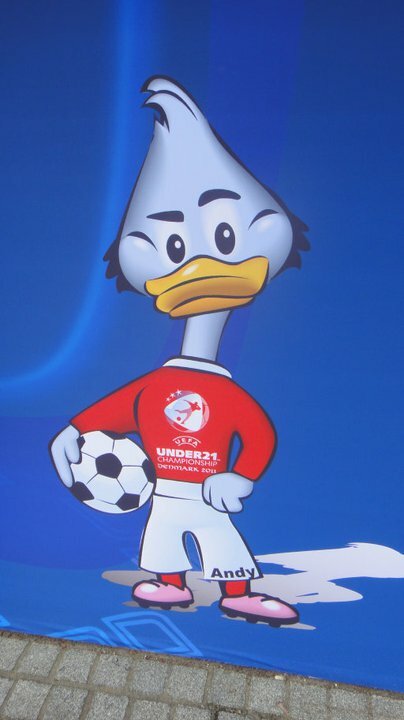 The suits at UEFA made a good decision back in 2007 when they decided to move the U21 Tournaments to odd numbered years, giving those of us who haven't been to a game for a few weeks the chance to do some summer football. To be honest I wasn't overly fussed about doing this one, but seeing as the flights were only £22 in total it would have been rude not to. Most of that amount was a Ryanair fee to pay with a credit card. I was thinking I could have booked another cheap flight to go to their head office in Dublin and pay in cash, but they've got you cornered as you'd then have to pay the card fee for the flight to Dublin I suppose. UEFA did 'print at home' tickets on their website for the games that were little more than a fiver each, so not bad at all. I guess 'print at home' tickets (or maybe even 'flash your smartphone with a barcode at the turnstile' tickets) are the way forward, although this is a bit distressing for someone like me who carefully preserves all of their match tickets in a nice shoebox. A scrappy printout just doesn't cut it. We flew to Aarhus - or what I understand is a field somewhere in the vicinity of Aarhus - on Saturday morning. Having paid for an economy hire car we got given a pretty sizeable Toyota Avensis, and when you stuck it in reverse a live image came up on the dashboard screen of what is behind you, I was amazed! Not sure why I said it was live, wouldn't be much use if it had a five minute delay. 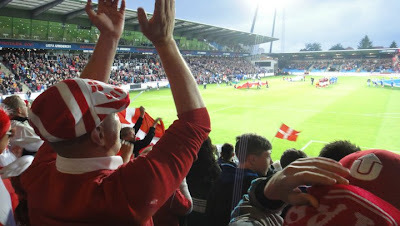 Now there was a game on in Aarhus (Switzerland v Belarus) but I figured it would be better to drive an hour or so to see the host nation play and get caught up in the fervent fever of an U21 tournament, so off to Aalborg it was for Denmark v Iceland. 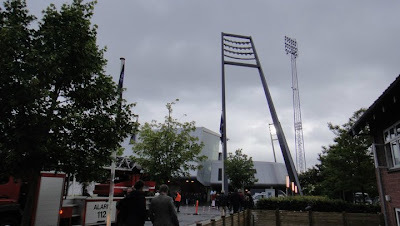 The weather was a bit rainy and grim so we headed off for some scran and a couple of beers in the centre before setting off for the twenty minute walk to the stadium. 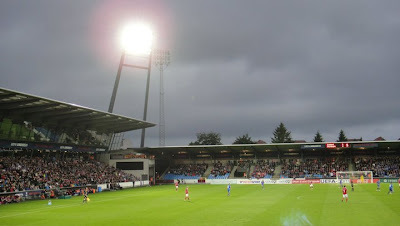 The Aalborg stadium reminded me a bit of Wycombe, similar sort of size, with one big two tiered stand towering over the other three. The 'print at home' tickets didn't scan so Mr Steward had to wave us through. Bizarrely with the game being a sell out our tickets were for unreserved seating so it took quite a bit of hunting before we found two seats together. 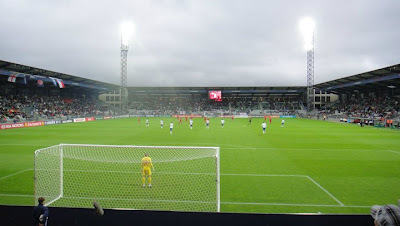 The game was very open, and with a decent atmosphere, but surprisingly remained 0-0 at half time. Apparently this was the first time ever in an U21 Tournament that no team was mathematically eliminated before the final group game, and also the first time no team had qualified before the last round of games. Of course the experts on Sky Sports did say that Iceland were all but eliminated barring a freak miracle. 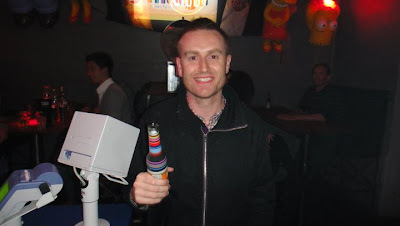 Of course what then happened in the second half was that the men from Iceland showed ice cool nerve and came within a whisker of qualifying for the next round. A 3-1 win coupled with a 3-0 reverse for Belarus against Spain in Aarhus meant that the unthinkable nearly happened. Remarkable scenes. This meant that both teams lay distraught and motionless on the sodden turf on the final whistle. One more goal for Iceland and they would have pulled it off. For those sad geeks that like football grounds (oh that will be me then) bizarrely there were two sets of floodlights with two sets next to each other in each corner. One set were proper old school and unused, black criss cross style, the other looking all angular and modern. It's like the new floodlights have bullied the old floodlights out of the way, but for some reason the old ones have stayed up. Back to the game and there were 42 shots on goal! That worked out about 10p a shot. Bayer Leverkusen striker Jorgensen was very good for Denmark but the Danish centre half, who was also called Jorgensen (or Zanka as he has on the back of his shirt was terrible. He must be one of these players that gets away with having his nickname on there - personally I think only Pele should be allowed to get away with that). Bournemouth had a Danish player called Jorgensen once, and of course there was also Martin Jorgensen the Inter Milan midfielder. I think Jorgensen must be the Danish version of Jones. Then it was off out onto the Jomfru Ane Gade. This is a very famous strip of bars and nightclubs in Aalborg. Think Magaluf but with drinks ten times dearer. I took a bit of a shine to a drink called a Cult Modju which was a mixture of a Red Bull-type energy drink and cider, deeeeecent! Leaving to call it a night at 3am, the whole street was still absolutely rammed inside the bars and outside you could hardly move in the street for people and there was no danger of anything closing. All of the Jorgensens were out enjoying themselves. After a lazy morning and some brunch it was off to Viborg and game number 2. England v Czech Republic, with England needing a win to progress. 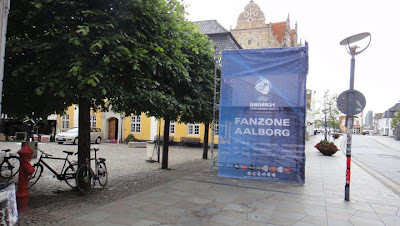 I think it is a rule that in these tournaments all of the venues have to be within a certain radius so it was only an hour or so to Viborg. Stuart Fuller from The Ball is Round told me that Viborg had two cows and nothing else, but he was wrong as we found a couple of bars open, and an Italian place with a cracking all you can eat buffet - which might have got slightly abused by yours truly. 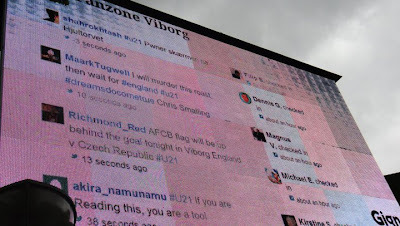 They also had a live band on in the fanzone thing in the little square, this also had a jumbo screen on that showed a twitter feed with any hashtags #U21 in them. This means that unknown to me my previous insightful tweets on the tournament from watching the games on TV have been appearing on these giant screens in the host cities. Of course this also gave me something else to abuse which meant some jokey tweets about certain mates of mine followed by #U21 of course. Beckie [wife] said I was being immature but I thought it was funny (and still do). My Twitter name @Richmond_Red up in lights. Up The Cherries. On to the game and the stadium, just a ten minute walk away from the thriving metropolis was another 10,000 capacity, a bit like Walsall but without the giant adverts facing the M6. 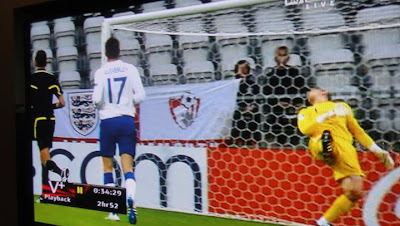 Plenty of room to get my AFC Bournemouth flag up in prime position behind Frank Fielding's goal. Most of the English fans seemed to be up the other end, but there certainly weren't many, maybe about 30 or so. The whole game consisted of Jordan Henderson collecting the ball from the centre backs and then not really knowing where to pass to. What we had learnt from the first two games was to keep the ball better and cut down on the long balls, but we forgot to really deliver anything incisive in the final third. We were easily the better side and when Welbeck notched a smart header near the end we thought that was it, but of course we are England and we ended up losing. Not good enough really! Having said that Smalling and Jones were outstanding, Man United have got a couple of right good defenders there. I am also a big fan of Frank Fielding, no-one else wants to play second fiddle to Joe Hart so get him in the full squad now. It was then back to the luxurious Motel Viborg ready for the early start to come home on Monday morning. The motel even had Shetland Ponies and a goat in the grounds. Seeing a goat in Viborg is quite exciting as there isn't really a lot else to see. All in all a decent trip for what we spent, no chance of a cheap trip to the next one in 2013 as it's in Israel. I wonder if they have goats in Israel?